Adding flaxseeds to your diet boosts your intake of fiber, protein and omega-3 fatty acids. You can put raw, ground seeds in smoothies or sprinkle over cereal. You can also benefit from consuming baked goods containing flaxseeds. Heating flaxseeds does not measurably change the nutritional content. Flaxseeds provide 37 calories and 3 grams of heart-healthy fat per 1-tbsp. serving. A tablespoon also offers 2 grams of fiber – much of which is soluble, making it helpful in treating constipation. Flaxseeds are a source of thiamine, phosphorus and manganese. They also provide small amounts of iron, calcium, zinc, potassium, vitamin B-6 and folate. Flaxseeds contains lignins – plant phytonutrients – that may help combat cancer. 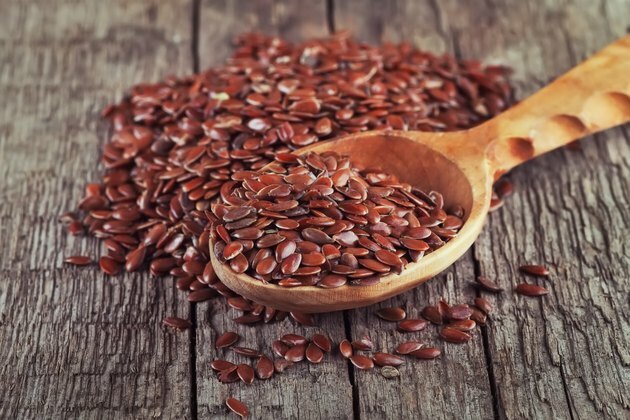 The fat in flaxseed is known as alpha-linolenic acid, or ALA. ALA is an omega-3 fatty acid, important to brain development and function and crucial to the prevention of heart disease. The ALA in flaxseed withstands temperatures involved in baking – meaning that muffins and breads with ground flaxseed can still offer this heart-healthy fat. Lignins also remain stable when heated to temperatures consistent with baking, so flaxseed-containing muffins, breads and crackers continue to provide these phytonutrients. The fiber content of flaxseeds is also not affected by heating. Protein may be broken down by heat, but this makes it more easily digested. Thiamin may be destroyed by high temperatures, however. Baked goods containing whole flaxseeds may not provide you with much of the seeds’ beneficial nutrients. In order for your body to digest and utilize flaxseeds, they must first be ground. If you choose to use flaxseed oil, avoid cooking with it, as the heat can change the nature of the fats so they are no longer beneficial. Store flaxseeds or flaxseed oil in dark containers in a cool space. Flaxseed and oil are vulnerable to spoiling, so replace them often. Is Flax Seed Still Healthy After Cooking?